Met alle slimme apparatuur die we tegenwoordig in huis hebben, wordt het ook steeds belangrijker om die apparatuur te beschermen tegen online aanvallen. De Dojo is een firewall en malwarebestrijder die domotica, zoals slimme meters, sloten, lampen en thermostaten beschermt tegen online aanvallen. Ook smartphones, smappee, tablets en computers worden door de Dojo beschermt tegen virussen, malware en hacks. Via de Dojo App krijgt u telkens een melding als uw Dojo iets verdachts detecteert. De Dojo is zelflerend op basis van netwerkverkeer. Volgens de makers worden persoonsgegevens niet ingelezen. De Dojo is naar verwachting te koop vanaf maart 2016. Let’s turn your connected home into a happy haven by protecting it from cyber attacks and privacy violations. Dojo secures your privacy making sure you’re in control of your personal data. A security technology that connects to your network and acts as the essential layer between your smart devices and any threats to your security and privacy. 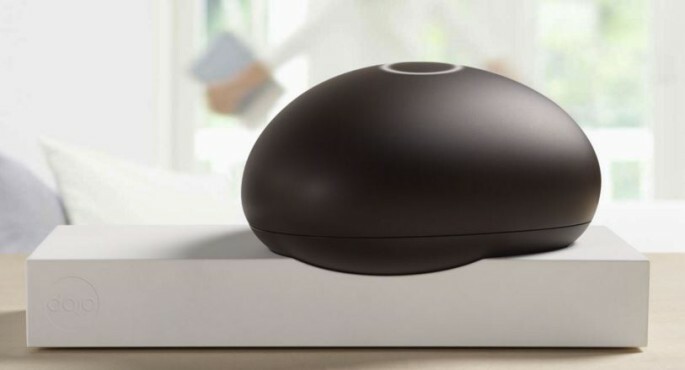 The pebble is free to move about your home and glows when there is activity that needs to be addressed in the app, and is designed so it doesn’t need to be yet another thing you line up next to your TV. Dojo keeps in touch via a simple chat app, and only gets in touch when there’s something afoot. Most importantly, you are in control. Dojo makes sure you’re aware of any issues before they affect your privacy or security. In just one tap, you decide. Dojo actually learns. It gets to know your devices and finds patterns in their behavior. Using this intelligence, it then sets up a perimeter that protects your home and makes sure that you are in total control. Nothing gets in or out. Dojo’s sophisticated defense system utilizes pattern recognition to learn to detect threats. It does this without even having to look at the data or knowing what’s attacking. Dojo can simply block them. It listens to patterns, not your data, to keep your home safe and your data private.